Radiance Tiebacks and Trimmings are created by Hallis. These tiebacks can add a touch of decadence to your soft furnishings with this beautiful collection of tiebacks and trimmings available in stunning, modern colours. The Radiance tiebacks are a beautiful tassel with a range of co-ordinating trimmings available to match. The tiebacks are available in colours; Pearl, Gold, Platinum, Rose Gold and Pewter. Firstly, the Cord Trimming is available in colours; Pearl, Gold, Platinum, Rose Gold and Pewter. Secondly, the Flanged Cord Trimming is available in colours; Pearl, Gold, Platinum, Rose Gold and Pewter. Thirdly, the Braid Trimming is available in colours; Pearl, Gold, Platinum, Rose Gold and Pewter. Fourthly, the Ball Trimming is available in colours; Pearl, Gold, Platinum, Rose Gold and Pewter. Lastly, the Beaded Trimming is available in colours; Pearl, Gold, Platinum, Rose Gold and Pewter. 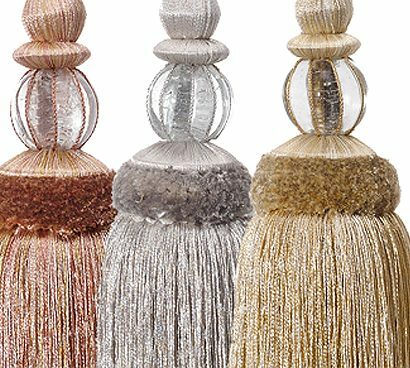 The Radiance collection uses glass beads and lustrous yarns to inject light and glamour into soft furnishings. As a matter of fact, this collection is inspired by precious metals, the Radiance collection features a subtle metallic glimmer to provide an opulent embellishment for your soft furnishings. These tiebacks will look fabulous in a bedroom, living room, dining room and even a hallway. In addition, the trimmings would look great on the bottom of roman blinds or on the bottom/side of curtains. These look beautiful in any home and are a great gift to give a friend or family member so that they can add a splash of elegance to their room. If you have plain natural curtains you can always add a tieback to add that bit of glam and colour to the curtains. Furthermore, if you have a plain roman blind you can add the ball trimming to the bottom of the blind to add decoration to the room. The beaded products are not a toy and may contain components that could detach or break and become a hazard to small children. Please click this link to view the full range on our website.